Can the vast nation maintain its progress? Centuries ago, Brazil was a remote Portuguese colony. Today the biggest nation in Latin America has evolved into a stable democracy, a regional power and an important U.S. and European Union partner. Economic growth has been steady, fueled by rising food exports, and the burgeoning oil and ethanol industries have helped the country become energy independent. Twenty-eight million Brazilians have been lifted out of poverty in the past decade. Globally, Brazil participates in numerous peacekeeping missions and is becoming an aid donor rather than recipient. The picture is not all rosy, however. 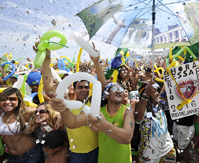 Brazil needs major infrastructure upgrades before it hosts the 2014 FIFA World Cup and the 2016 Summer Olympics. The Amazon rain forest continues to disappear, drug gangs control many city slums and the country increasingly relies on cheap Chinese imports. Nevertheless, as Brazil's new President Dilma Rousseff — a former guerrilla fighter — begins to make her mark, Brazil is a booming regional power.